Scrambled eggs are home-cooking at its most glorious. Quick, delicious, comforting, frugal, familiar. And almost never nice when eaten out, with catering establishment incarnations ranging from watery through to bouncy. And then there are those diet police versions, throwing away yolks and with them a whole load of flavour, protein, Vitamin D, iron and beta carotene. This meal is a regular in our house thanks to our girls. Cooking the eggs like this is a good way of enjoying your scrambled eggs while introducing a little healthy monounsatured oil and vegetable. 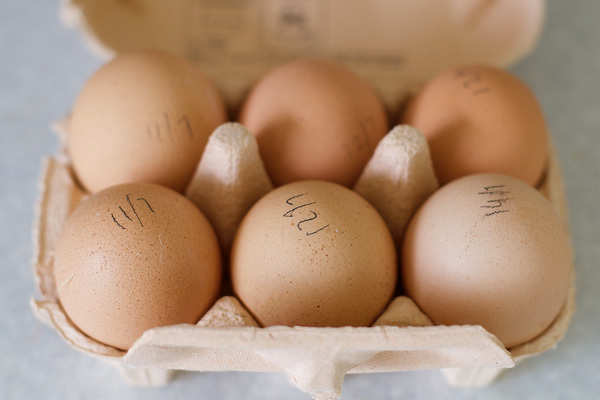 We use olive oil to cook the eggs and then a little knob of butter to finish them off with that silky texture. 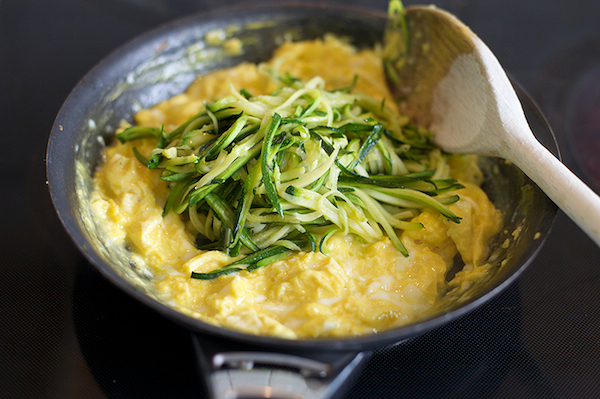 Zucchini are mild enough to let the taste of the eggs shine and cutting them into thin ribbons lets the vegetable meld into the soft scramble, rather than introducing unpleasant lumps. I add the merest hint of a mint for a little whisper of freshness (any more and it will be overpowering). Anyone who is a gardener has an abundance of courgettes this month. Even I have one plant, despite drastically reduced home growing this summer in deference the aforementioned house move. If I can recommend one piece of equipment to you it would be a julienne peeler – thin courgette strips have myriad of uses and a peeler is a doddle to use and clean, plus much less dangerous than a mandoline (I don’t think my cuisipro peeler is available any more, but you’re looking for something along these lines). I don’t seem to be able to make up my mind what to call them. I’m starting to prefer using the word zucchini instead of courgette – wonder if this is down to the hours spent hanging out in this multicultural space, or a nod to the fact courgette were probably my most hated vegetable as a child, whereas I really rather like them now. You’ll have to excuse me for the to-ing and fro-ing between the two for now. Depending how hungry you are go easy on the bread. Scrambled eggs wait for no man so get all of your ingredients prepped and the toast under the grill before you begin to cook the eggs. Finish the eggs off with a small knob of butter if wished. Heat a teaspoon of olive in a small non stick pan over a medium heat. Add the ribbons of courgette and cook for about a minute - the courgette should soften just a little but stay bright green. Remove the courgettes from the pan and place in a warmed bowl. Return the pan to the heat and pour in 2 teaspoons of olive oil. Turn down the heat to low. Crack the eggs into a bowl and whisk together, seasoning with plenty of pepper and a little salt. Pour the eggs into the pan and stir continuously with a wooden spoon as they scramble. When the eggs are almost cooked return the courgettes to the pan as well as the chopped mint. Take the eggs off the heat and add a little butter if wished. Serve immediately while hot. Engaging narrative, delectable photos, and a brilliant recipe for zucchini. Thank you. I’m not growing any summer squash myself this season (not enough space) but I often have it offered to me — now I know what I shall make with it. I agree, homemade scrambled eggs are the best. These ones look delicious. Lovely idea Sophie. I shall be making this very soon. I have always done small chunks of zucchini in the past, but I like your idea of juliennes, which fold into the scramble. And I’ve never seen a julienne peeler before – what a neat little gadget. I bought a mandoline almost exclusively to make easy veg juliennes, had no idea there was a peeler that did it too. Kathryn – the julienne peeler has been on of my top kitchen finds. 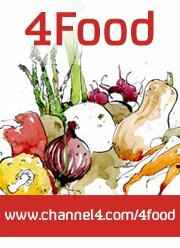 Vegetables are prepared in seconds. Now if only there was something like it that diced onions…. Thanks for reaching out on Twitter! Your blog url is not mentioned there..have a lovely space. Glad to come here, and hope to come for more. 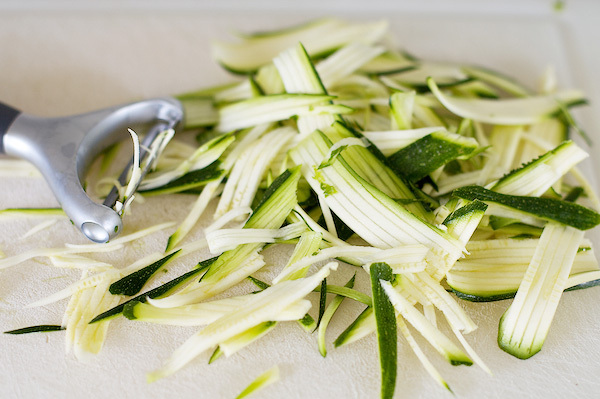 zucchini – a lovely word to say, but damn tricky to spell! Just stumbled across your site – very lovely. I enjoy reading through it. Just had it for my breakfast yumyyyyyy !!!!!!!!!!!! Nice fresh flavour of mint and a little bit cruncy courgette. Absolutely Yummy! 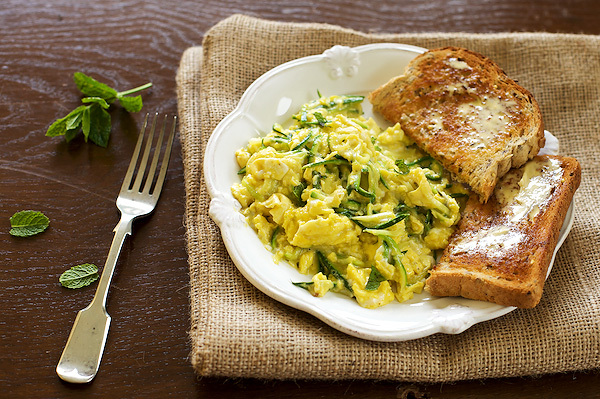 Scrambled eggs have no comparison & this one with zucchini also looks savory Nice & tasty Recipe. Sophie, I finally made your scrambled eggs today and they’re really delicious. The day before my next vegie box delivery meant I only had 3 eggs, one zucchini and half a bunch of kale in the fridge, so your zucchini speckled scramble was perfect. I made mine with parsley from the garden, but I reckon the mint would be even better. And a little sprinkle of feta, right at the end, wouldn’t go amiss either. Thanks for posting, I shall be making this again. Finally made this for my lunch today. I wanted something quick and easy, but fairly vegetable rich. Had eggs and zucchini and I suddenly remembered your scrambled eggs. Makes a perfect meal for one, especially on a slice of wholegrain toast. Although I think my zucchini must have been bigger than yours as mine was definitely more zucchini heavy. I grated the zucchini and, given I didn’t have any fresh mint, added a teaspoon of capers to the mix. This is feast for my eyes. Your photos are amazing! Thank you for posting this recipe. I will definitely have to try this one.